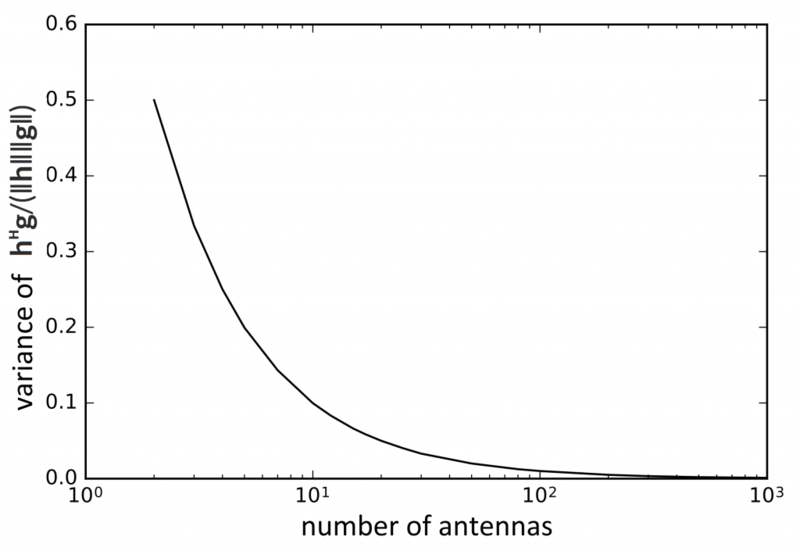 (Note: M is the number of antennas, K is the number of users, and G denotes the channel matrix). Again you ask: in what practical sense? 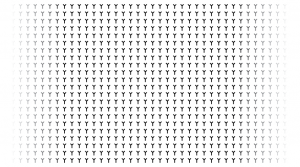 If h∈ℂᴹ is the channel vector to one user and g∈ℂᴹ the channel vector to another, the users are said to be orthogonal if hᴴg = 0. Unfortunately, this is never true in a real system. It can be practically true, however, if we say that users are practically orthogonal when hᴴg/(‖h‖‖g‖) has mean zero and a variance that is much smaller than one. There we go: a more-or-less rigorous definition of Massive MIMO. Note that this definition does not require the number of users to be small in any sense. So, to the big question: How many antennas does a base station need to be “massive”? The answer is given for the i.i.d. 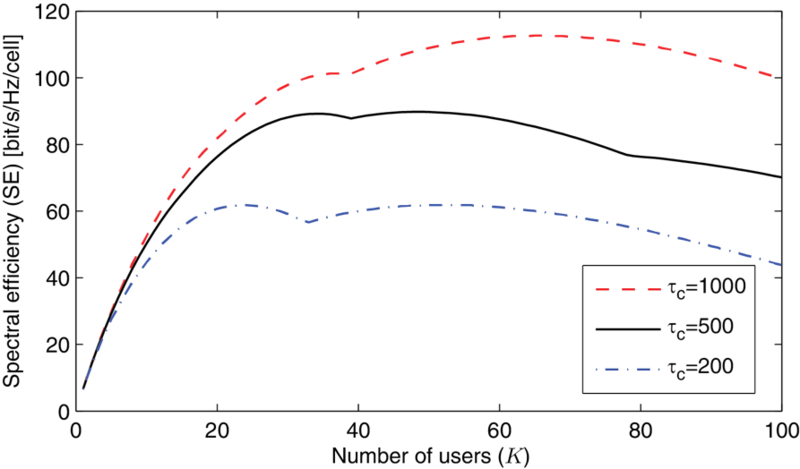 Rayleigh fading channel in the following curve that shows how the users’ channels become practically orthogonal as the number of antennas is increased. T. L. Marzetta, E. G. Larsson, H. Yang, N. Q. Ngo. Fundamentals of Massive MIMO. Cambridge University Press, 2016. T. V. Chien, E. Björnson, “Massive MIMO Communications,” in 5G Mobile Communications, W. Xiang et al. (eds. ), pp. 77-116, Springer, 2017. One question tends to reoccur: How many antennas can a Massive MIMO base station usefully deploy? Current thinking for macro-cellular is that 100-200 antennas would be suitable. Will we in the future see a lot more, thousands or so? In that application, I don’t think so. Here is why. What ultimately limits Massive MIMO is mobility: no more than half of the coherence time-bandwidth product should be occupied by pilot transmission activities. (This is the “half and half rule”.) In macro-cellular at 3 GHz, with highway mobility we may have on the order of 200 kHz x 1 millisecond coherence; that is 200 samples. With pilot reuse of 3 (that practically does away with pilot contamination), we could, then ultimately learn the channel to some 30 simultaneously served terminals – assuming mutually orthogonal pilots. Once the number of base station antennas M reaches beyond twice this number, with some margin – say M=100, the spectral efficiency grows logarithmically with M. That means, even doubling M yields only a 3dB effective SINR increase, that is a single extra bit per second/Hz per terminal. Beyond M=100 or M=200, it may not be worth it. Multiple antennas are only truly useful if they are used to multiplex, and mobility limits the amount of multiplexing we can perform. So why not quadruple the number of antennas for additional coverage? May not be worth it either. Going from M=200 to M=2000 gives 10 dB – that pays for a 75% range extension, or, alternatively, a tenth of the losses incurred by an energy-saving coated window glass. In stationary environments, the story is different – a topic that we will be returning to. How distant into the future? It is often claimed in the academic literature that Massive MIMO can greatly improve the spectral efficiency. What does it mean, qualitatively and quantitatively? This is what I will try to explain. With spectral efficiency, we usually mean the sum spectral efficiency of the transmissions in a cell of a cellular network. It is measured in bit/s/Hz. If you multiply it with the bandwidth, you will get the cell throughput measured in bit/s. Since the bandwidth is a scarce resource, particularly at the frequencies below 5 GHz that are suitable for network coverage, it is highly desirable to improve the cell throughput by increasing the spectral efficiency rather than increasing the bandwidth. 256-QAM is generally not an option in cellular networks, due to the inter-cell interference and unfavorable cell edge conditions. Numerical simulations can, however, predict the practically achievable spectral efficiency. The figure below shows the uplink spectral efficiency for a base station with 200 antennas that serves a varying number of users. Interference from many tiers of neighboring cells is considered. Zero-forcing detection, pilot-based channel estimation, and power control that gives every user 0 dB SNR are assumed. Different curves are shown for different values of τc, which is the number of symbols per channel coherence interval. The curves have several peaks, since the results are optimized over different pilot reuse factors. Uplink spectral efficiency in a cellular network with 200 base station antennas. From this simulation figure we observe that the spectral efficiency grows linearly with the number of users, for the first 30-40 users. For larger user numbers, the spectral efficiency saturates due to interference and limited channel coherence. The top value of each curve is in the range from 60 to 110 bit/s/Hz, which are remarkable improvements over the 3 bit/s/Hz of IMT Advanced. In conclusion, 20x-40x improvements in spectral efficiency over IMT Advanced are what to expect from Massive MIMO. suggest the use of 1-bit ADCs in Massive MIMO base station receivers. Important studies of a concept, that offers great potential for cost saving and simplification of transceiver hardware. 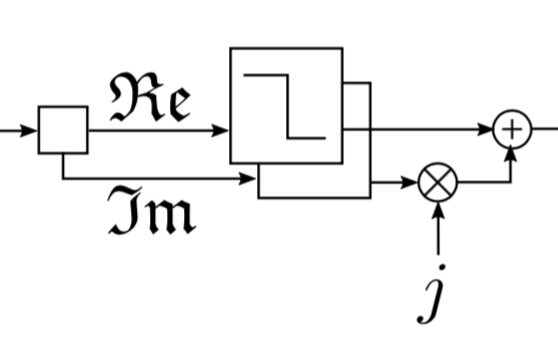 One-bit ADCs quantize the sign of the real and imaginary part of the complex baseband signal. Granted, much lower resolution will be sufficient in Massive MIMO than in conventional MIMO, but will one bit be sufficient? These papers indicate that the price to pay is not insignificant: the number of antennas may have to be doubled in some cases. Also, while the use of symbol-sampled models as in these studies may give correct order-of-magnitude estimates of capacity, much future work appears to remain to understand the effects of digital channelization/prefiltering and sampling rate conversion if 1-bit frontends are going to be used.